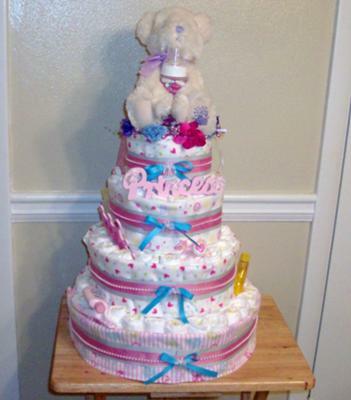 Take a look at this cute 4 tiered Princess Diaper Cake below! Latrice shared her beautiful diaper cake creation with us and added another wonderful source of ideas, colors, and inspiration to our diaper cake gallery. She used contrasting blue bows on pink ribbon, nice embellishments and fun 'Princess' lettering. Thanks for sharing such a pretty diaper cake Latrice!